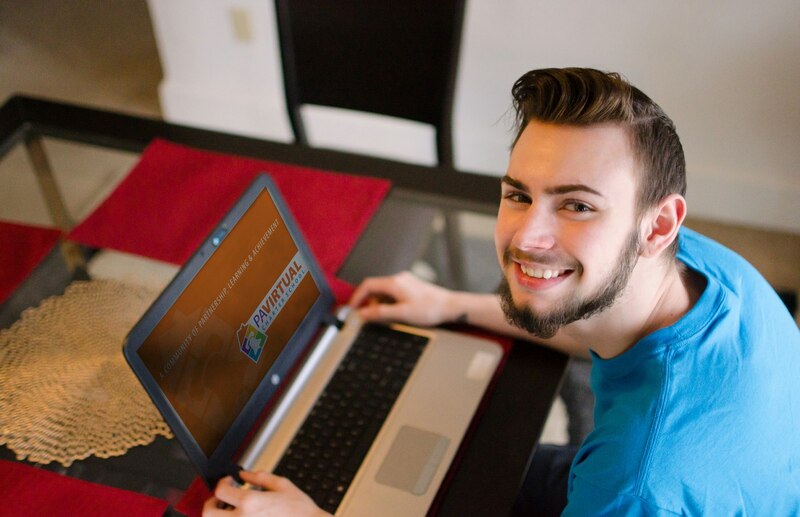 Like the other cyber charter schools in Pennsylvania, PA Virtual has had some promising test results, and identified areas for improvement over the years, for the reasons provided above. It’s not just cyber charters, many school districts struggled when the Pennsylvania Department of Education (PDE) switched over to PA Core Standards in 2014 and the new test format. 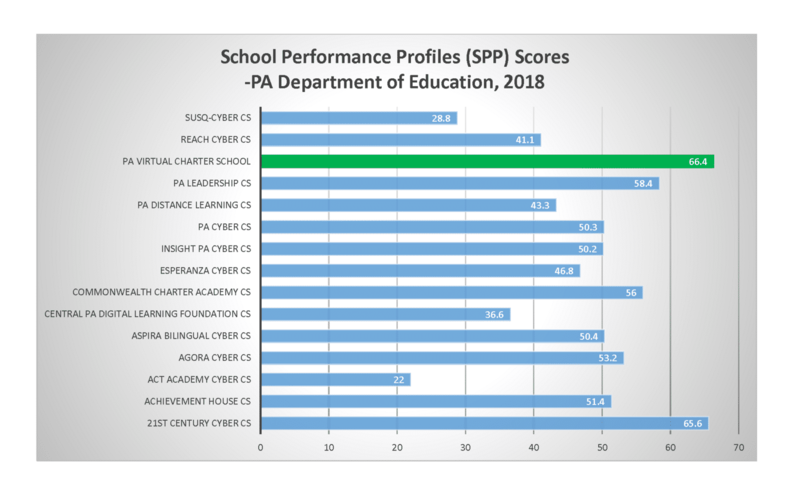 Despite these hurdles, PA Virtual Charter School is pleased to announce that we received the highest School Performance Profile Score out of all cyber charter schools in the state for the 2017-2018 school year! Per PDE, The Pennsylvania School Performance Profile (SPP) is an integral part of the Educator Effectiveness System. The SPP provides school-level academic scores for all public schools, including charter and cyber charter schools. School Performance Profile scores are calculated based on assessment data including PSSA, PASA, and Keystone exam performance, as well as closing gaps in student achievement levels and the degree of student growth over time. While SPP scores are no longer used to inform the public about the academic performance of each school (that is now done through Future Ready PA Index), the SPP still serves to provide building levels scores for educators as part of the Pennsylvania educator effectiveness system. A school that teaches its students effectively, even if students are academically below grade level, needs to demonstrate solid academic growth to bring students to grade level. Exhibiting academic growth is critical. PA Virtual’s 2017-2018 SPP indicator score for English Language Arts ranked in the top 20% of all charter schools (both brick-and-mortar and cyber). For English/Language Arts and Science, PA Virtual earned the highest 2017-18 SPP indicator scores among cyber charters receiving scores for Meeting Annual Academic Growth Expectations. For Mathematics, PA Virtual earned one of the top two 2017-18 SPP indicator scores among cyber charters receiving scores for Meeting Annual Academic Growth Expectations. The 2017-2018 SPP results and PVAAS growth measures demonstrate that PA Virtual provides students with effective instruction delivered by an experienced teaching staff, and a model that works. PA Virtual families know first-hand about our phenomenal teachers. PA Virtual’s teachers are state-certified and have an average of 12 years of teaching experience. The PA Virtual teaching staff also averages over eight years of service to the school; they are experienced in teaching in the cyber charter model. Our seasoned teaching staff are skilled at ensuring students grow academically and are dedicated to students achieving a year or more growth during each school year. We are proud to share that nine of our teachers were nominated for 2020 Pennsylvania Teacher of the Year! PA Virtual utilizes the unique Diamond Model of Partnership with the PA Virtual student at the center. Each component of the Diamond Model is integral to help our students achieve their full academic and social potential. The partnership with the parent as the Learning Coach is critical to a child’s success in this model. The Learning Coach is responsible for monitoring student progress and to assist students in meeting the requirements of the PA Virtual curriculum. Our students could not have achieved the academic growth demonstrated in our PVAAS score without our strong partnership with parents. Students are also supported by the other three pillars of the Diamond Model. Our academic program is built to challenge students without overwhelming them. PA Virtual teachers are experts in teaching and learning using the K12® Inc. curriculum. They focus on creating an interactive learning experience that meets each student’s individual needs. Our award-winning Family Support Department provides an array of resources and opportunities for students and families and engages families in the school community from enrollment to graduation. Finally, PA Virtual students use the mastery-based K12, Inc. curriculum supported by state-of-the-art technology to enable customized learning for every student. We want to see each child make academic progress regardless of where they came from. Our students meet or exceed academic growth standards and we will continue the work to meet PSSA & Keystone proficiency targets. Our 2017-2018 SPP and PVAAS growth scores both demonstrate that our teachers, instructional methods, and Diamond Model of Partnership work to help students achieve solid academic growth. PA Virtual will continue to meet students where they are and work tirelessly to help them achieve academic success. PA Virtual is enrolling now for the 2019-2020 school year. Learn more about PA Virtual by clicking the button below. Fill out the short form to receive information about our school delivered right to your inbox.